Excerpts from — Matt Gatton, “The Light of Amen-Ra: The key role of projected images in the Pharaoh’s ritual renewal.” Originally posted March 9, 2010. Ancient Egyptian texts, known collectively as the Books of the Netherworld, describe pharaonic funerary complexes as sun-powered resurrection machines that somehow affected a merger of the pharaoh’s soul with the sun god. The enduring mystery is how these complexes worked. Pharaonic mortuary temples faced east toward the morning sunrise. 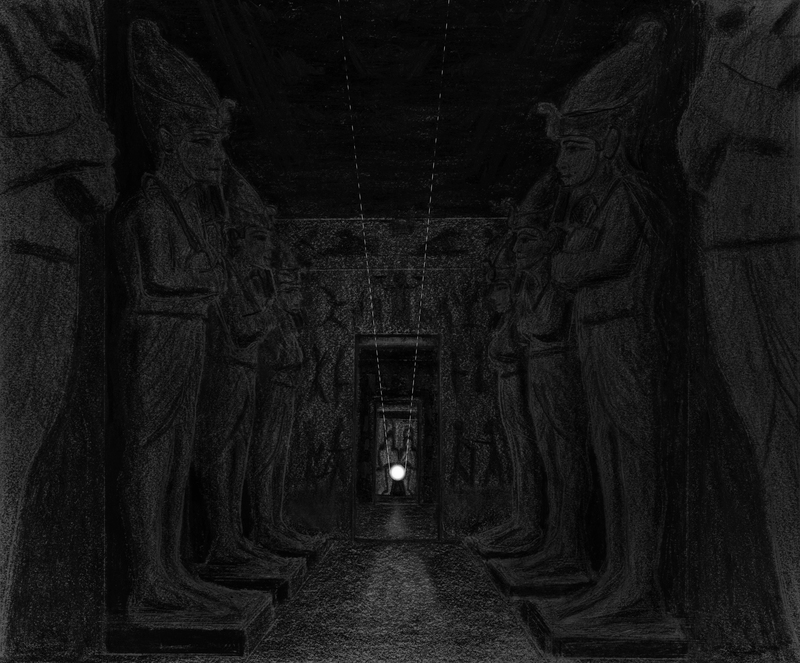 The darkened inner-sanctuary held the pharaoh’s ka statue. The ka is a spirit double, created at birth, with the physical appearance of the person. After death, the ka would leave the body and travel through the underworld at night and return to its physical representation each morning. When the sun rose its image was cast onto the ka statue. Simultaneously, the image of the ka sculpture would reflect and project outward onto the sun. The visible image flows from bright space to darkened space, but there is also a set of rays reflected from the dark space into the light space, though they are imperceptible to human eyes. This is the conceptual leap that forms the underpinnings of Ancient Egyptian culture, and the key to understanding how the pharaoh’s soul and the sun on the horizon were united within the architectural scheme.